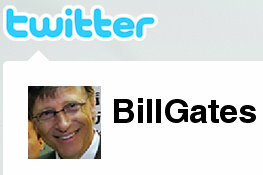 Let's Welcome Bill Gates To Twitter! Let’s Welcome Bill Gates To Twitter! Bill Gates, the founder of Microsoft and currently the world’s richest man, has officially joined Twitter! You can follow him here @billgates . His account is verified already, and he’s even received a warm welcome from the king of Twitter himself Ashton Kutcher (@aplusk). And about an hour ago, Bill Gates then retweeted back to Ashton Kutcher (see retweet here). Here are some impressive Twitter follower numbers for you – and keep in mind, Bill Gates joined Twitter only about 6 hours ago, according to his first tweet. I’m sitting here hitting F5 on my screen while watching Bill Gates’ Twitter profile, and each time I hit F5 to refresh, his follower count increases anywhere from 10 – 20 followers – that’s about every 2 seconds. As of right now – 9:24pm, he has 86,694. However, since it took me a second to type that, he is now probably approaching 87,000 followers. Yeah, Bill Gates is a popular guy!